Latin America looks to expand its commercial potential following recent meetings in the City of Santiago De Chile. 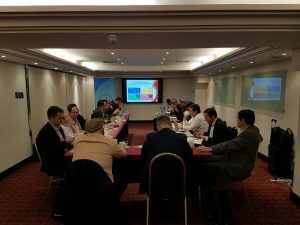 The International Table Tennis Federation organised a marketing meeting in the City of Santiago de Chile on Friday 6th and Saturday 7th October to discuss maximising the commercial potential of table tennis in Latin America. The leaders and officers from within the region were present, together with ITTF’s Mr. Steve Dainton (CEO), Mr. Raul Calín (Secretary General), Mr. Michael Brown (Chief Financial Officer), Mr. Gonzalo Barak (Pan American Marketing Manager), and Mr. Freddy Almendariz (PANAM Competition Manager). The main topics on the agenda included Strategic Planning, the Future Events Structure, and the PANAM Situation. Also discussed were ITTF’s plans in relation to the World Championships and other international events, in addition to updates on TTX. During the meeting Michael Brown presented a summary of ITTF-Oceania’s Strategic Plan. It was seen as a good case study due to similarities between the Oceania and Latin America regions, and particularly because of the benefits the plan will bring to table tennis within Oceania. Meanwhile, Raul Calín’s presentation highlighted the latest news and developments for the Buenos Aires 2018 Youth Olympic Games and the 2019 Pan American Games in Lima. Steve Dainton, who led the meetings, stated: “It was a pleasure to be in Chile together with so many people who have a true passion to grow and develop table tennis. We had great discussions and we can now move forward to work on an agreement to strategically invest in the region. We hope in the future there will be more international events in Latin America and the ITTF promises to help ensure the regional events are of a higher standard and can achieve the marketing needs to grow the sport. There is a lot of potential for growth in the Pan America region”. Henry Reimberg, President of Chilean Table Tennis Federation, manifested: “We are in a very interesting moment of table tennis around the world and we are glad to have hosted this important activity. I want to thank all the officers who attended for their support and to especially thank the ITTF for always considering Chile for the organisation of events. We are very excited for the times coming ahead”.